The first 108 LU graduates have started receiving their emails about the hand signed diplomas. A copy of the email sent to Tostie14 is below. You have completed the required course load on the Dean's List and qualified as one of the first 108 graduates of LOST University. 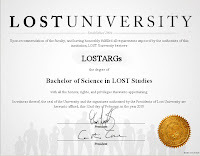 Your prompt completion of studies has earned you the privilege of receiving a special hand-signed diploma from University Presidents Damon Lindelof and Carlton Cuse. In order to provide you with your personalized diploma, the Office of the Registrar will need to collect your mailing address. Please provide this information in a reply to this email or in a separate email addressed to: LostUDiploma@xxxxxxxxx. "I AGREE TO HAVE MY FULL NAME LISTED AS ONE OF THE FIRST 108 LOST UNIVERSITY GRADUATES ON THE LOST UNIVERSITY WEBSITE AND BLU-RAY APPLICATION." Your degree and graduation from LOST University is truly a triumph and memory you will cherish for the rest of time. Once again we congratulate you.